This is a book about the limitations of economic statecraft. Stephan Haggard and Marcus Noland explore why the United States and United Nations (UN) have found it extremely difficult to influence the Democratic People's Republic of Korea (DPRK) with sanctions and inducements. Their wide-ranging analysis examines how the DPRK's narrow ruling coalition, the structure of its economy, and its foreign economic relationships have made the regime remarkably resilient to attempts at bribery and bullying. Haggard and Noland approach their study with the intuition that the DPRK is a unique case and therefore adopt a theoretically eclectic approach to understanding its idiosyncrasies. Their analysis delves into the details of how the DPRK has managed to survive while being both reliant on foreign assistance and subject to robust sanctioning campaigns—including by the states that provide it with assistance. Readers will gain a deep appreciation of why the DPRK represents such a vexing challenge for the international community. Rather than being a “how-to” guide for employing economic statecraft against difficult targets, Hard Target is more of a cautionary tale. This book has a lot of strengths related to the depth of its political-economic analysis. 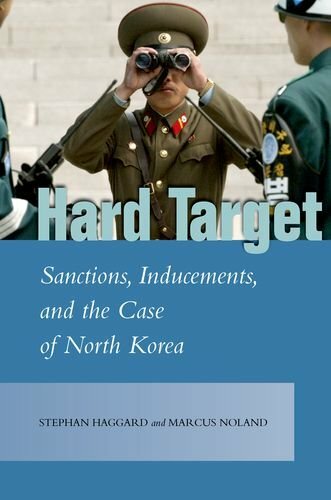 Haggard and Noland begin by explaining how the structure of the DPRK's regime and its infamous willingness to tolerate the suffering of its citizens makes it “relatively impervious to sanctions” (p. 228). The authors then detail how the structure of the country's economy and its mix of foreign economic relationships have evolved since the end of the Cold War. They discuss the roles that trade, investment, remittances, and foreign aid have played in the DPRK's survival strategies. The authors explain how the DPRK used the trade, aid, and investment provided by South Korea, China, and even the United States to help it survive the sanctions. They cast significant blame on China for undercutting the sanctions’ effectiveness. The authors then link their economic analyses to how the international community unsuccessfully employed economic statecraft against the DPRK from 2001 to 2016. One shortcoming of the book is that the authors cast the DPRK's circumstances as being too unique. The authors overlook a pertinent body of research that has explored how sanctions-busting states can undermine the effectiveness of sanctioning efforts and what motivates sanctions busters to do it. That research indicates that many of the findings related to the spoiler role that China and South Korea played in undercutting the sanctions against the DPRK apply to many sanctions targets. This suggests that while the DPRK constitutes a particularly hard target for sanctions along many dimensions, the survival strategies it adopted are actually widespread. Haggard and Noland draw several important conclusions regarding the DPRK. They observe that the DPRK frequently responds to sanctions by escalating their behaviors instead of acquiescing. Using inducement-based strategies does not lead to backlashes, but the authors’ analyses show that inducements were largely ineffective. Haggard and Noland also conclude that the DPRK's leadership is utterly committed to its nuclear and missile programs and will sacrifice the country's economic welfare on its programs’ behalves. They conclude that “the United States and its allies should not overestimate the degree of influence it has on North Korea” (p. 231) through the use of economic statecraft. Recent events offer further support for a number of Haggard and Noland's conclusions, especially regarding the DPRK's escalatory responses to increasingly stringent UN Security Council sanctions. What remains to be seen is whether the continued ineffectiveness of economic statecraft will lead to an enduring stalemate or a calamitous military alternative. If policymakers truly give up on economic statecraft against the DPRK, the options become far more limited and grim.